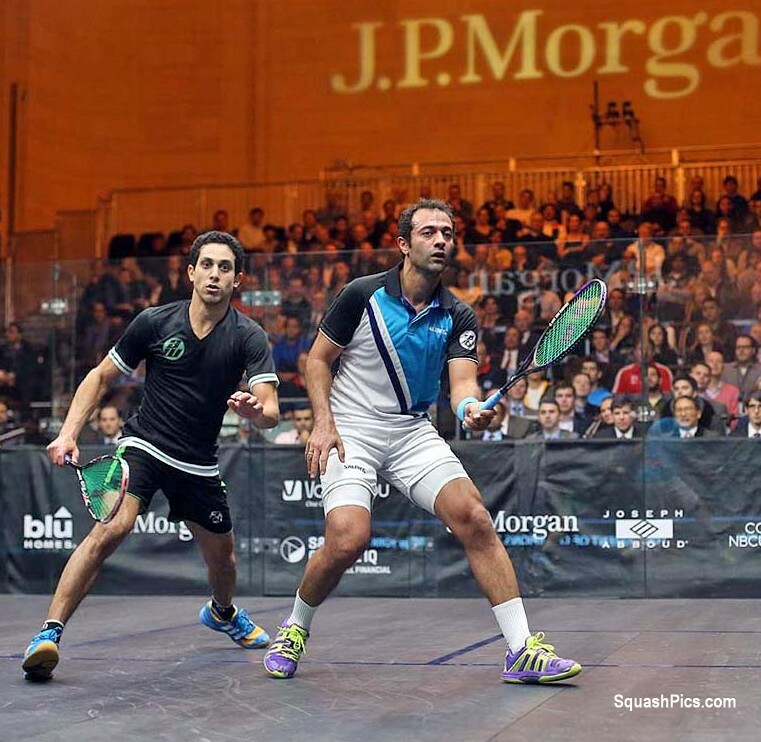 Defending champion Amr Shabana kept alive his hopes of winning back-to-back J.P. Morgan Tournament of Champions titles with a gutsy 3-1 win over compatriot Tarek Momen, the World No.7, in an 85-minute match-up in Manhattan’s Grand Central Terminal. 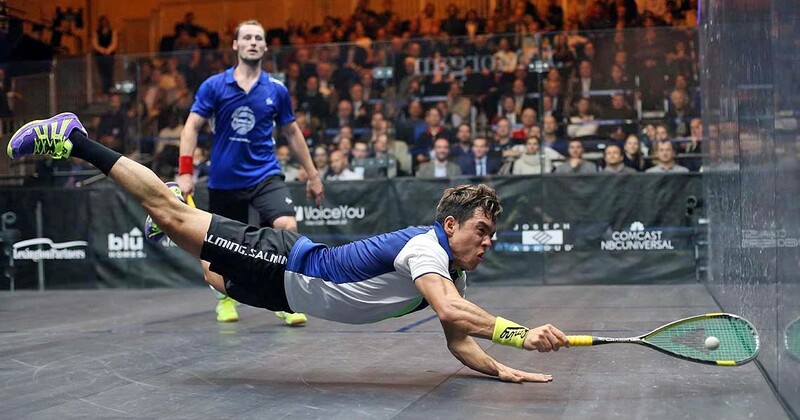 The 34-year-old, who became the oldest ever PSA World Series winner with his 2014 triumph, withstood a ferocious challenge from 27-year-old Momen, currently enjoying his highest ever ranking on the PSA World Tour, as he dug deep and used his wealth of ability and experience to squeeze over the line in a nail-biting encounter. 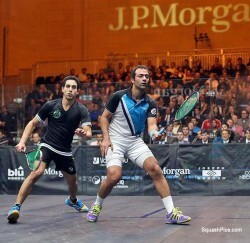 “All credit to Tarek because I spent every single bit of energy I had to beat him today,” said Shabana. Shabana opened up the match with an array of spectacular winners, taking the opening game in the process, but saw his advantage eradicated after a gallant effort from Momen saw him bounce back from squandering numerous game-balls to eventually take the second game 19-17. The duo continued to trade points in compelling fashion throughout the next two games but it was four-time World Champion Shabana that emerged victorious as the match ended in bizarre circumstances, with both players seemingly disappointed following the referee’s decision to award a stroke that handed the match to the elder man. 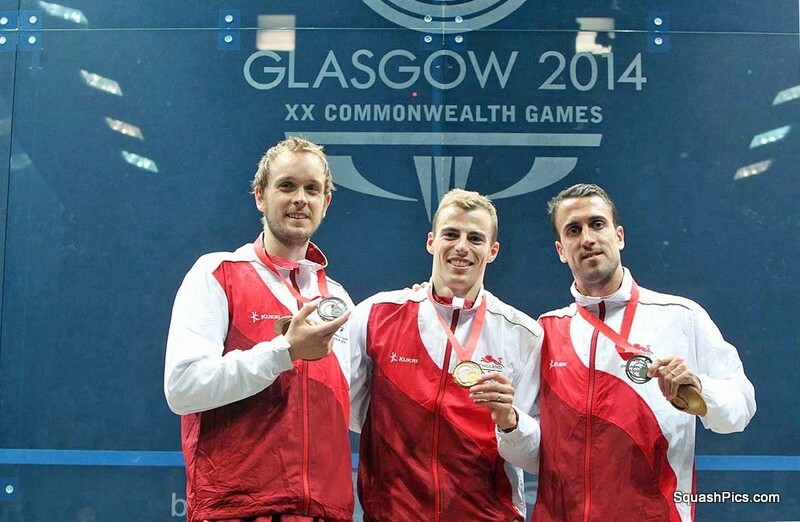 “The last point could have been a let, but it’s a win and I’ll take it,” added Shabana. 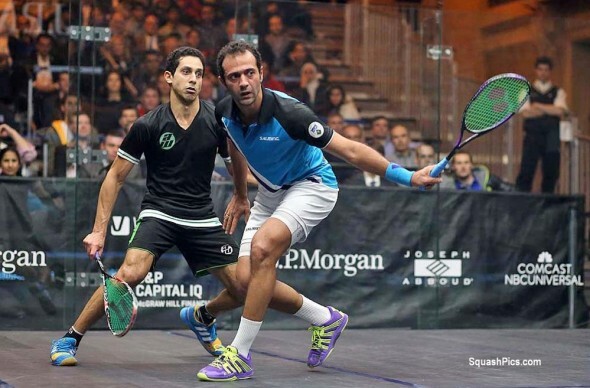 That victory will see Shabana take on another Egyptian, current World No.1 Mohamed Elshorbagy, for a place in the finale when the semi-finals get underway on Thursday. 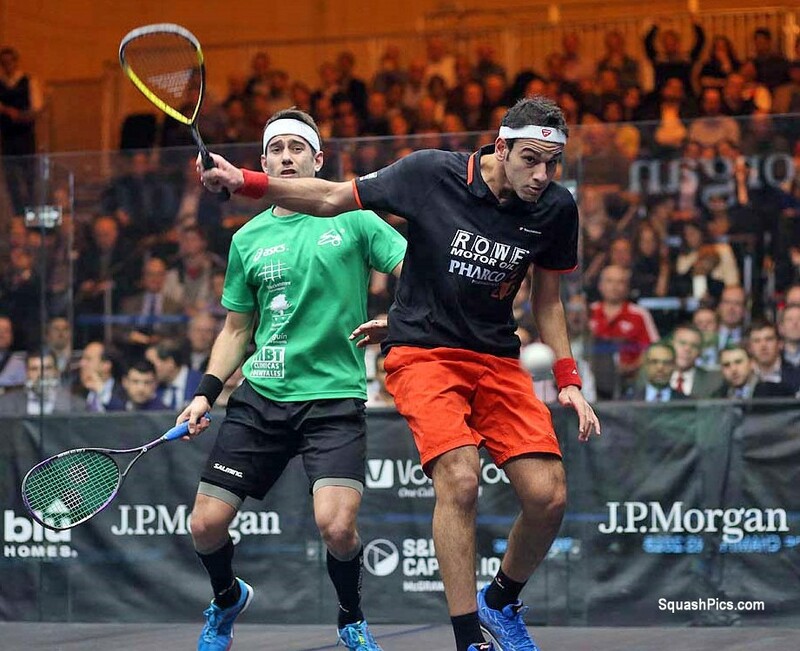 Elshorbagy booked his place in the last four with a dominant 3-0 win over World No.12 Borja Golan. 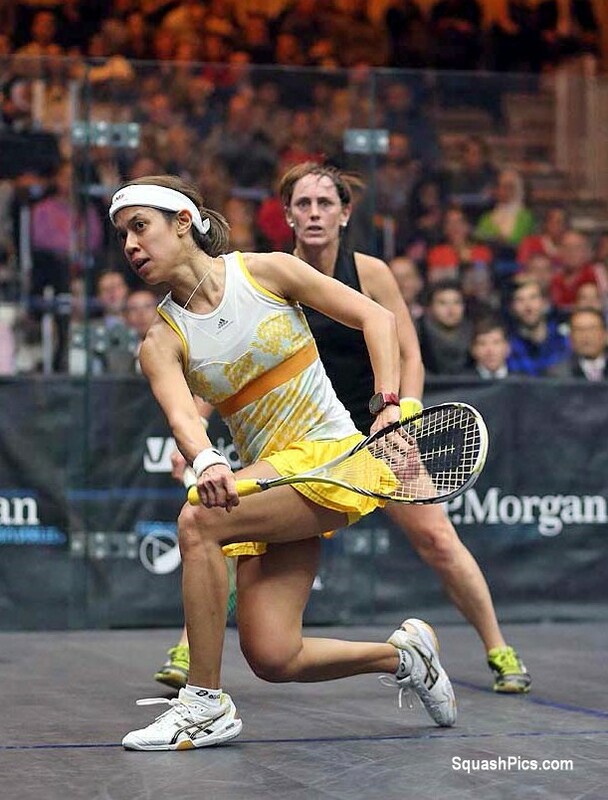 Malaysia’s world number one Nicol David successfully began her defence of the Women’s J.P. Morgan Tournament of Champions title in New York with a four-game victory over career-long rival Rachael Grinham in the first round of the WSA International 100 squash event at Grand Central Terminal. 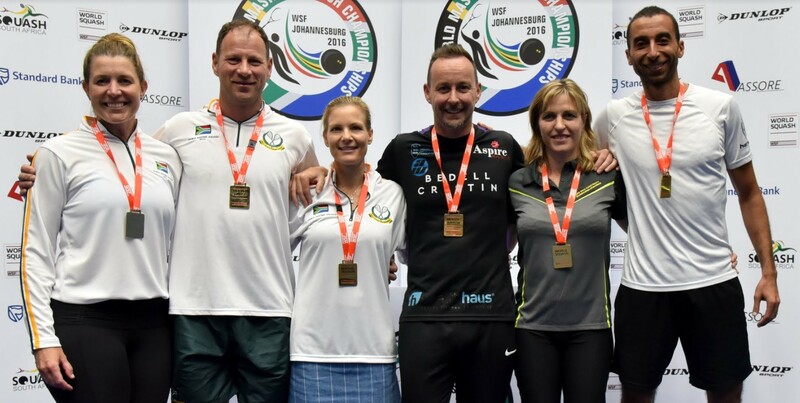 Incredibly, it was the 36th WSA World Tour battle between the pair since April 2000 – more than three years before Australian Grinham began her own 16-month run at the top of the WSA world rankings. In the first game, Grinham marshalled some of the skills and speed that earned her four British Open titles to jump out to a 7-4 lead and win the game 11-6. “I had to find my way in,” said David, who has been number one in the world for 105 months (102 consecutively). The “way in” that the 31-year-old Malaysian superstar found was to lift the ball up on the front wall, establish her position in front of Grinham and extend the rallies. “I was starting to feel a little oxygen debt after the second game,” Grinham confessed after the match. In each of the second and third games, David took the lead on the first point and never relinquished it. Grinham looked like she might have found her second wind in the fourth as she battled back to 5-6 and 6-7, but David calmly closed out the match with an 11-7 fourth game win. David progresses to face Alison Waters, the fifth seed from England, for a place in the semi-finals. 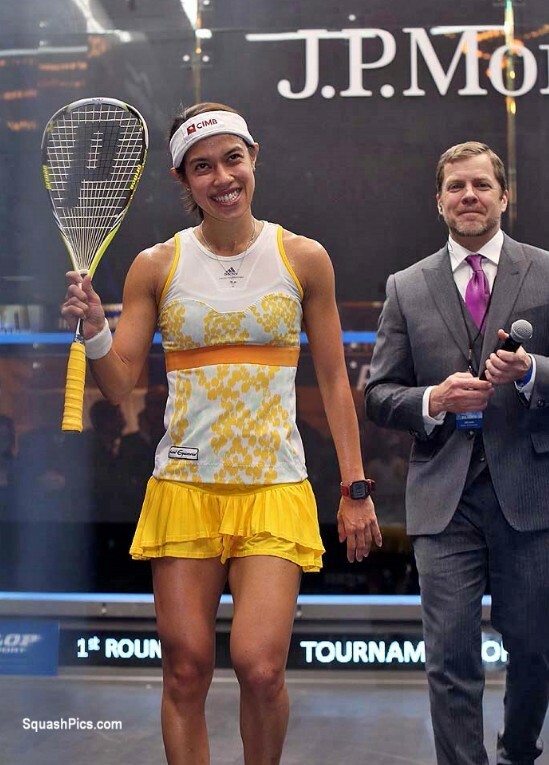 In the match-up between two rhythm players who patiently await their openings, it was Londoner Waters who quickened the tempo to claim victory over Mexican qualifier Samantha Teran to claim a spot in the quarter-finals. Teran had played three tough qualifying matches to get to the ToC glass court, and, in the first game, that proved to be an advantage. 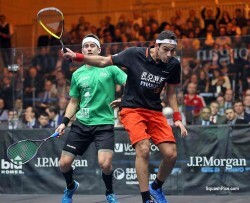 The 33-year-old from Mexico gained the upper hand at six-all, reeling off five straight points to take the early lead. “It is very tricky to play someone who plays the same style of game as you do,” said Waters. In the second game, which she won 11-6, Waters found her comfort zone, hitting the ball slightly more crisply and using the volley attack with more frequency. 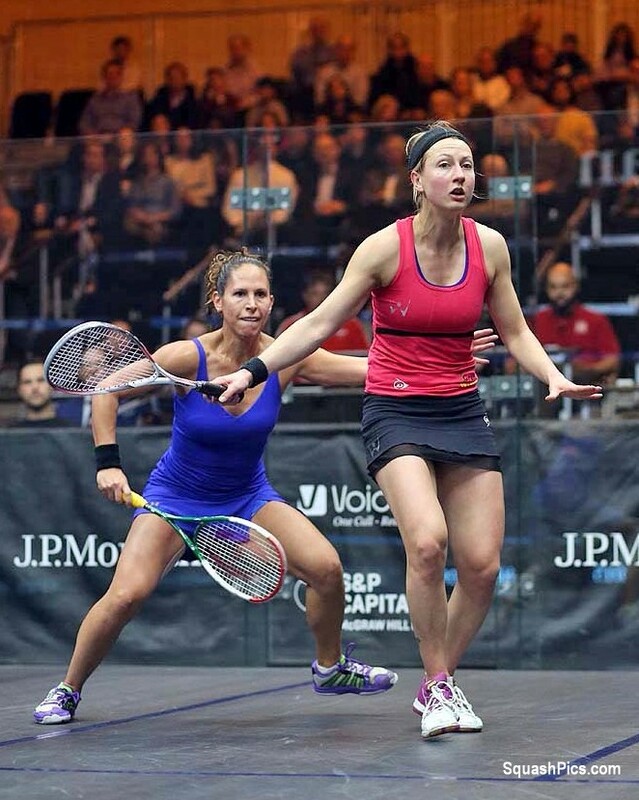 By the last two games, the four-time British National Champion was in high gear, closing out the match 11-3, 11-5. In a repeat of last year’s ToC semi, Waters and David will mark their 25th career Tour meeting, with the Englishwoman looking to double her victory tally over the dominant Malaysian.